Though I made a meal plan last week, I completely flaked out on sharing it. I didn't want to make that mistake again this week. Baked Sesame Tofu Sticks with PB, tahini, and ginger sauce: I've made these before. This time around I made them without the peanut sauce on the side. The sticks were good, though Pat said he would have liked to have had the peanut sauce with them. Oh well. 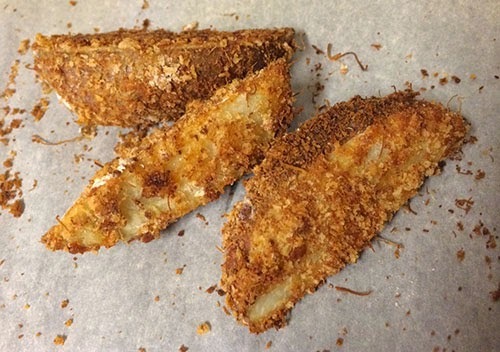 Parmesan Potato Wedges: These went over so very well at my house. Please see Week 8 of Pinning with Purpose for my full review. Italian chicken soup: I've made this before, and we really like the flavors in it. However, I forgot just HOW MUCH it makes. We both had our fill and there was still enough leftover to fill two gallon-sized freezer bags. I didn't even use all the pasta or chicken because my pot was almost overflowing already. It's a great, filling soup. Though, I only need to make it once a year as it makes so much! Whole Wheat Pizza Dough: Oh, this stuff was great! I ended up deciding to have pizza for lunch instead of dinner so I prepared the dough just after breakfast. It really came together so quickly. I love that it required very little kneading. Since the pizza was just for the two of us, I only made one pizza and froze the other half of the dough. As for the taste, It was really yummy. I do wish I had a rolling pin to get the dough a tad bit thinner so it will crisp up more, but otherwise it was great! 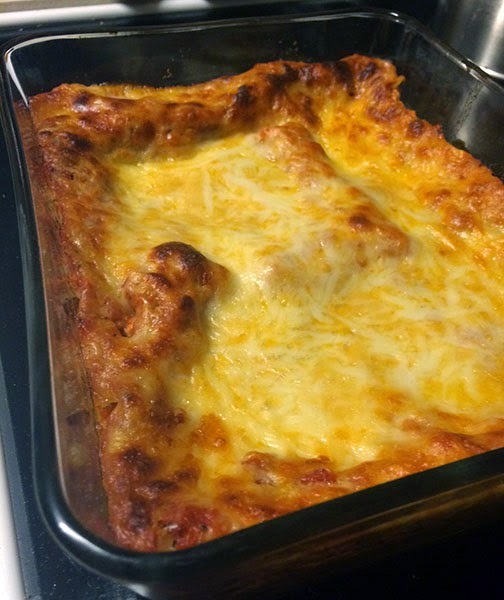 Three Cheese Skillet Lasagna: I didn't realize until I had this on the menu (and all the ingredients bought) that it requires cooking in the oven and not just in the skillet. As my deep skillet has a plastic handle, it can't go in the oven. I improvised with a casserole dish instead. It worked out fine. The lasagna came together quickly and was yummy too. I might just refer to this recipe again. Hashbrown Taco Casserole: This was pretty good. I used soy crumbles instead of the ground turkey and it turned out just fine. With our microwave still broken, the leftovers just sat in the fridge though. I might make this again. We'll see. Baked Spaghetti Squash and Cheese: I've been searching for a spaghetti squash recipe that we really like and just haven't found one yet. With my love of mac-n-cheese, I thought this just might be it. I used broccoli instead of the spinach since I don't like cooked/wilted spinach. The result was tasty, but still not THE recipe. I probably won't make this again. The search continues. If you've got a GREAT spaghetti squash recipe, please please please share it with me. I want to like the stuff so much, but it just keeps coming out mushy. Now, what's on your menu this week? Oh, my gosh, these all sound so good, I don't know where to start! I've made whole wheat dough for pizza, and I love how easy and healthy it is. I'm trying to ditch all white flour products! I have tahini in the fridge I should use, so I'll be trying your tofu sticks.